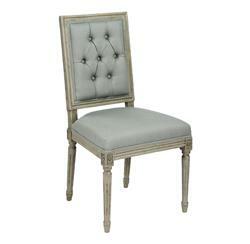 Understated elegance is at the heart of French Country interiors, combining formal and casual with ease. In creating the improvised, yet cohesive look, seating plays a major role and pieces like this sage linen dining chair are the foundation of great rooms. Tufted details, classic carpentry and a slightly distressed finish on the frame create a dignified, yet inviting effect. Item sold as a pair.